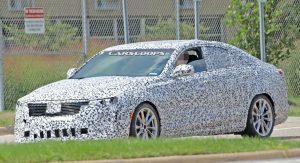 Cadillac is in the midst of reworking its lineup of passenger cars. There’s a new CT5 under way to split the difference between the current ATS and CTS, effectively replacing the latter. But here we have something different, something… smaller. 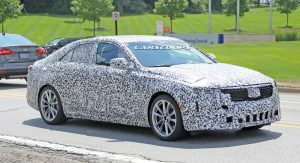 And our spy photographers tell us it’s paving the way for a new entry-level sedan for the American luxury marque. 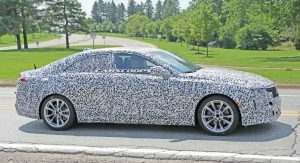 Tipped to carry the CT3 or CT4 badge, this sedan is expected to slot in (size-wise) below the ATS and effectively take its place as Cadillac’s smallest model. 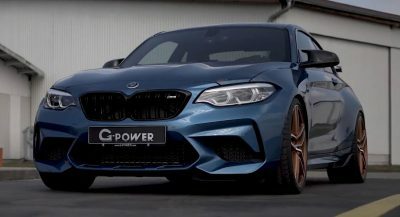 That would put it up against the likes of the new Mercedes A-Class and Audi A3 sedans at the lowest point on the luxury-sedan totem pole. Like those models, it’s expected to offer all-wheel drive – but unlike them, it’d come in rear-drive guise as standard, ostensibly giving it a bit of an advantage over the competition in terms of driving dynamics. 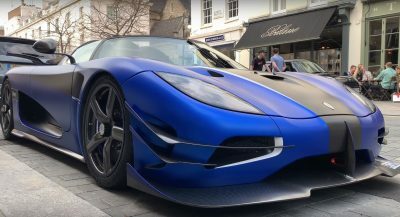 It’d also likely offer a range of engines, chief among them a turbo four, potentially with both six-speed manual and eight-speed automatic transmission options. 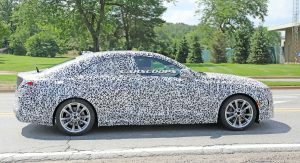 The sedan could also yield coupe and/or convertible variants to take on the BMW 2 Series and help Cadillac mount a concerted assault on the lower end of the luxury marketplace together with the new XT4 crossover. 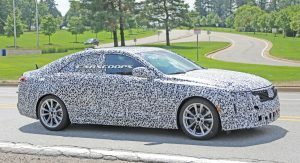 Though the details still remain tightly under wraps, the prototype appears almost entirely devoid of heavy body cladding. 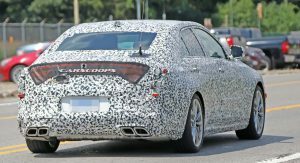 That not only gives us a fairly clear look at its overall shape, but tells us that the sedan could already be fairly close to completion. So don’t be too surprised to see it unveiled before the end of this year. Since, its Cadillac, I would guess like every current Cadillac. Cadillac seriously needs to hire different designers. Their designs look dated before they come out, and what they do on concepts doesn’t translate down to production enough. This already looks like the proportions are off, and the C pillar looks generic. Hard to do much of anything w/ the subcompact segment; can say the same for the A Class, 1 Series and A3. Huh? All of those models have some differentiation in taillights to the rest of their stablemates. 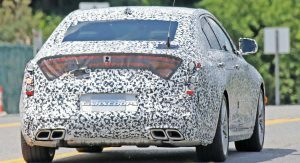 All Cadillac taillights are vertical and have barely any difference to their stablemates. The first models to diverge from this are the CT6 to a degree and the going to be dropped XTS with its swoop. Cadillac art and design language is extremely dated at this time point. They need something new. 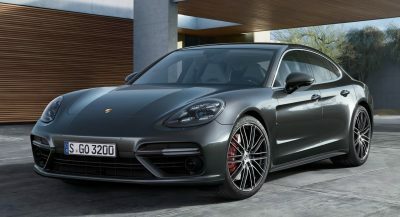 Personally, I’am a bit tired of the ‘Art and Science’ design language but I guess they’re trying out an evolutionary design approach similar to the German Premium marques. Has the Escala design-language which is a fair departure from A&S. “Art-and-Science” in terms to GM is nothing more than marketing, in my opinion. 2018 Cimarron with AMG exhaust tips. People don’t buy small Caddy’s. Except this is nothing like the Cimarron and your comment is nothing but keyboard warrior trolling BS. You can’t really say its keyboard warrior in this case. The ATS and CTS both fail to meet anywhere near where Cadillac has wanted them to sell. And they fail every comparison they are in once the subject moves away from driving impressions. 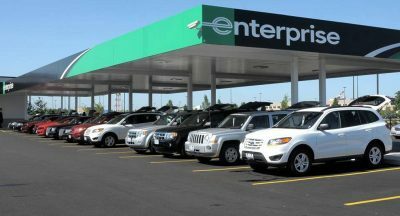 They are a one-trick pony, and that pony doesn’t drive sales sadly. And also speaking from personal perspective, I owned an ATS for a very short period of time. It was awful, not well built, and the infotainment was horrible. And no car I have ever owned depreciated so quickly. It was a horrible vehicle to own daily. The ATS and CTS failed in large part b/c of the packaging limitations of the Alpha platform. The CT4 is fine when it comes to interior space against its competition and the CT5 will have more passenger room than everything else w/ only the Q50 coming close. I agre on the Alpha platform. But how do you know about the CT5? In addition, history has proven that people DO NOT buy small Caddy’s. 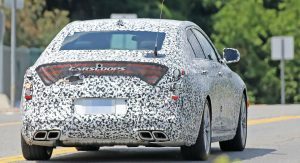 And just going by the photos this car looks like more of what Caddy has already done in the past, but with AMG exhaust tips. 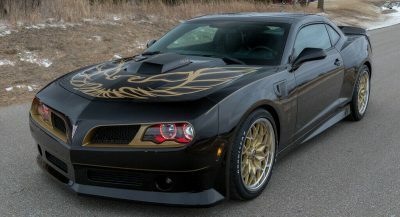 Additionally, your smugness suggest you know more about this car than is written in the article. But I doubt it. It’s RWD and utilizes the Alpha2 platform, you dunce. You mean douche. There, fixed it. I actually see a good amount of ATS’s in my area, wherever I go honestly. I’m tickled to see a small RWD offering from Cadillac, but it’s time for a new styling direction. It’ll probably follow the styling of the Escala. Too bad this isn’t liftback though. I’m wondering why people still consider RWD as more potent in term of driving dynamics when FWD are ahead of them in this segment of small cars and below. If you’re wondering now, you’ll probably never know. Love this answer: it says nothing but manage to make you come of as arrogant. Would’ve probably been RTS before the name change. 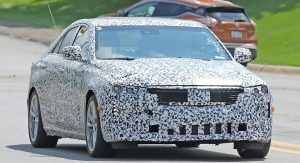 We are obviously looking at a next generation Camaro off this platform, I wonder if Chevy will do a RWD Malibu or Impala….., I still don’t get the FWD/AWD Blazer. Right, I think they should’ve at least offered the 3.0tt. This car was probably almost ready even before Johan was dismissed. I don’t think this article is correct. This looks like the CT5. 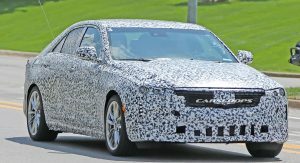 It even has the fake Charger taillight like the earlier CT5 spyshots. It’s simply too large to be a CT3/4. You can infer the scale from the pic with the trunk open and in side view if you pay attention to the wheelbase. This is not smaller than the ATS. If you go on Cadillac Society, it shows the CT5 and CT4 side by side. This is the CT4. Now I understand the confusion. I believe you are correct, but the picture with the trunk open is not the same car–which I now see from the detailed images on the Cadillac Society page. If you look at the license plate location, the CT4 has it on the bumper, where the CT5 has it on the trunk lid. The image I was judging the scale from is the CT5 tester. You can even see that the side glass is different (longer) on that one. I still say that this looks bigger than the ATS, so it goes against earlier reports that this would compete with smaller models like the A3 sedan–at least in size. 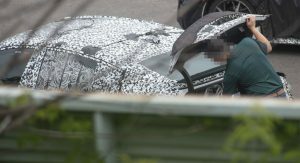 However, it is clearly smaller than the earlier spyshots of the CT5, and clearly a different car (not a short/long wheelbase version). The CT5 is significantly larger. 4-door Camaros, with Cadillac badges, aren’t exactly a bad thing. Especially since 6-speed manuals are still being considered as part of the mix. Call me when they have the stones to deliver something along the lines of the Elmiraj…or Ciel. Im going to set my expectations very low. I really want to like cadillac, but they don’t give me much reason to. Lincoln has been making an effort to rebrand themselves, while cadillac is still stuck in 2010. I hope for the best, but i highly doubt they’re going to shake things up for an entry level car. i just wish they would ditch the stupid alphanumeric nomenclature. 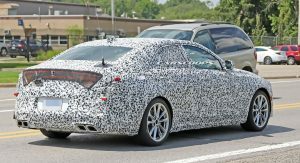 Being a subcompact competitor, being similar in size to the ATS is fine; the ATS might as well have been Cadillac’s subcompact offering due to its cramped interior. Find me one RWD hothatch that is better than their FWD or AWD competitors. An Alfa Romeo Quadrifoglio is only 11s faster on the Nurb than a Civic Type R.
You can like RWD all you want and find FWD ugly, I don’t care but calling them better is just not true anymore. Yes this is the CT4, comparisons by way of overlay confirm it.